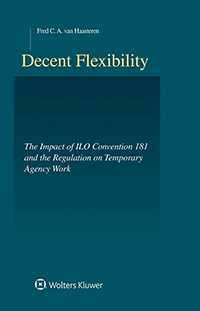 Decent Flexibility: The Impact of ILO Convention 181 and the Regulation on Temporary Agency Work aims to create awareness that flexibility in the labour market is allowed if decently regulated. Within the context of social law, temporary agency work has always been a subject of debate. The pursuit of more flexible forms of labour is at odds with maintaining decent labour relations. For that reason, ever since it was established, the UN organization for labour issues, International Labour Organization (ILO), has focused on private work placement. In its early years, it tended to prohibit or severely restrict private work placement, but gradually it came to acknowledge that, for instance, temporary agency work had positive aspects, and that a total ban was pointless. In 1997, this culminated in ILO convention 181, which was widely supported. This book, which was defended successfully at Leiden University as a doctoral Ph.D. thesis, reviews the impact of the convention during the past two decades and explores whether Convention 181 still has value. Which forms of work can be considered decent? What are the effects of globalisation? What are the developments in temporary agency work in the social domain? How do these developments relate to the wide range of flexible work forms that are increasingly catching up with temporary agency work? What are the challenges posed by decent flexibility? This book also discusses temporary agency work in the European Union. Due to its own, unique form of public-private regulation, Dutch regulation on agency work has been chosen as a good example of implementing ILO convention 181. The fact that Convention 181 features among the most ratified ILO conventions that have been effected since 1990 makes clear that it is increasingly gaining attention. In the light of these ongoing global changes, this book gives a good view of the development of the regulation on agency work and creates an understanding of why agency work is controversial and what could be done to regulate agency work decently. Thus, this book serves as a resource for labour lawyers and other legal professionals, economists, sociologists, and business experts, to further the development on policy-making on decent work in connection with flexible labour and its regulation, both internationally and nationally. Chapter 6 Global Social Dialogue: IFAs as a new trend?